WiseStamp-Featured in Mozilla's Addons front page! 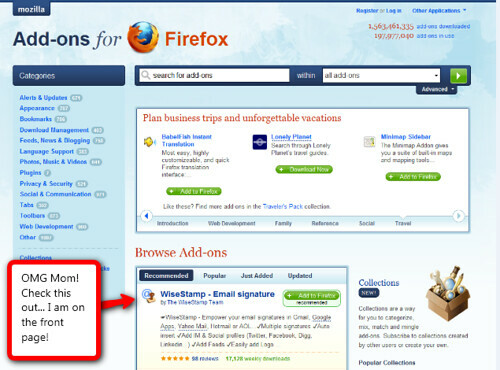 Home » WiseStamp-Featured in Mozilla’s Addons front page! WiseStamp-Featured in Mozilla’s Addons front page! After our previous post announcing we have become a recommended Social & Communication gallery Mozilla addon, we have received a Mozilla email telling us we are now recommended on the front page as well! It is a rotating list, but we bet you can find our logo pretty fast.